Happy Thanksgiving from MTS Software Solutions! For many of us, Thanksgiving represents a time of year to gather with friends, family, and loved ones to celebrate one another and to give thanks for the good fortune in our lives. It’s also an indication that the end-of-year is near – a time that we can reflect on the events of the year to date and begin to set intentions for not only the remainder of the year but next year as well. Let’s be honest. We all know that feeling. You’ve eaten too much turkey, too much of everything else, maybe even had a few adult beverages, and now you’re feeling a little, shall we say, sluggish. That familiar feeling after Thanksgiving Dinner is often attributed to tryptophan, an amino acid found in turkey that is said to make you sleepy. Well, those purported side-effects that tryptophan is having on your ability to do anything beside sit on the couch is quite similar to what managing paper is doing to your business. It’s slowing you down, inhibiting your productivity, and giving you that…feeling…like…you…can…barely…keep…your…eyes…zzzz. MTS Software Solutions can’t do much about how you’re going to feel after Thanksgiving dinner, but we can solve the paper problem. We focus on overcoming the costly impacts of manually managing paper with our software, hardware, and document scanning services. 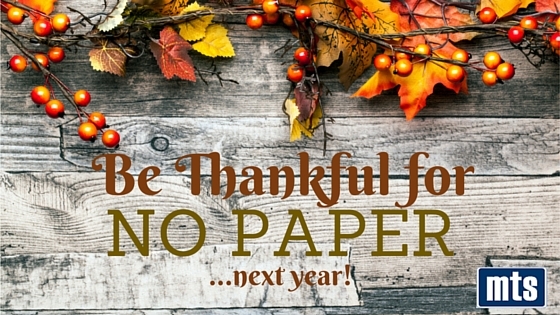 Here are some of the ways that MTS Software Solutions can reduce paper in your business processes so that you can toast to less paper processes at your Thanksgiving celebrations. Cheers! We provide best-of-breed Enterprise Content Management (ECM) and Document Management systems to fit organizations, departments, and budgets of all types, shapes, and sizes. As an OnBase by Hyland Gold & Diamond Support Partner as well as an Authorized DocuWare Partner, we have the tools, expertise, and experience to design a solution to simplify, streamline and accelerate your document and data-driven processes. We can also offer business process consulting and professional services to optimize your existing investments. Whether you already utilize software to manage digital files or are not quite ready to make that purchase, we can help convert the paper that is filling up desk space, filing drawers, and bankers boxes into digital files. We can transport, scan, and store your files and then return the digital files by importing into your document management system or delivering them via FTP, CD/DVD, etc. 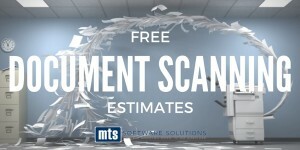 Click the image to request a free document scanning estimate. We sell, support, and service check and document scanners to simplify capturing paper and data as soon as possible. We can be your source for scanners, especially if you’re looking to scan checks for a Remote Deposit Capture solution or invoices at a shared services center. Check out some of the scanners that we sell and support. Is Your ECM Solution a Document Graveyard?